Arranged by topical order, God's Promises for boys, will be a helpful guide for 6-10 year olds to find topical specific verses to read and pray. God did not give us a spirit that makes us afraid. He gave us a spirit of power and love and self-control. This is a fantastic method of finding scripture to tuck in your heart for needs that arise. Young people are sponges for memorizing scripture and this book easily helps them find and read them on their own. The verses are quoted from the International Children's Bible. God Wants you to Stay Strong! Each topic starts with a short rhyming poem and ends with a illustration depicting the boy in one of the promises mentioned. 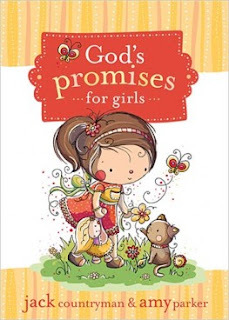 God's Promises for girls geared toward girls ages 6-10 takes a look at the Promises God holds for his little princessess. Many of the scriptures and promises are the same in the Girls and Boys books, making it easy to sit side by side with your son and daughter and go over the same memory verses with each! There are differences in some of the promises based on boys and girls, but for the most part the sections are very similar. The poem at the beginning and the illustrated work is different. I love that these two versions can be great companions to each other! Even some of the poems are identical. 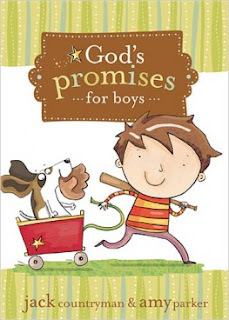 God's Promises for girls has such darling, whimsical illustrations! I love the sweet girl with the rosy cheeks and the beautiful detail that Rachel Miller took in illustrating them! This is an illustrator I would love to see more work from. What does Promise mean to you? When you ask your children what Promise means, what do they respond? God's promises never fail and are given in love. Help you young ones stand on the promises of God at a young age and be able to hide the Word in their heart for the future. Tommy Nelson is giving my readers the opportunity to win 1 copy of each of these Promises books. I am having one rafflecopter, with 2 winners. Please be specific if you prefer the Boys or Girls edition or if either would be fine! I received copies of these books in exchange for an honest review. All opinions expressed are solely my own. A promise is a statement of your intentions...it is a vow that you make to someone or yourself. Promise, to me, means to do everything you possibly can to do what you say you'll "promise" to do. I promise means I will! A promise means that your word is trustworthy. Promise mean the keep your word. Promise means that you will do what you say you will do. Howdy! I am about to start my own website and was wondering if you know where the best place to acquire a blog url is? this) I'm referring to "http://www.blogger.com/comment.g?blogID=7057552122140879526&postID=4628759822294815835". How do I go about obtaining one of these for the website I'm creating?